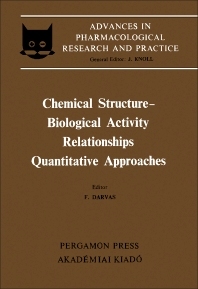 Chemical Structure-Biological Activity Relationships: Quantitative Approaches, Volume III, documents the proceedings of the 3rd Congress of the Hungarian Pharmacological Society held in Budapest, 1979. This volume focuses on the methodological aspects of QSAR. It also aims to inform the reader about the QSAR research conducted in East-European countries. This volume contains 38 presentations organized into six sections. Several lecturers deal with ""real prediction"" cases, i.e. activity estimation prior to the synthesis of the compounds. A particularly abundant section is devoted to the question of how the receptor models can be built up by means of QSAR calculations. Other sections present mathematical models and algorithms which could be applied to improve further the effectiveness of QSAR calculations. As another unique feature, a separate section treats the quantitative aspects of peptide structure-activity relationships—a field seemingly backward despite its evident importance. Hydrophobicity and its influence on biological potency along with the relationship of steric properties and biological activity are also discussed.